This is an amazing plum sauce introduced to me by Cathy of Mrs. Wheelbarrow’s Kitchen. I love Cathy’s recipe and have made it several times, tweaking it here and there. I replaced the jalapeno pepper with spices and a pinch of cayenne, also adding a handful of chopped, dried cherries. Meyer lemon zest and juice replace the salt in the original recipe. I prefer to cook mine for a couple hours as opposed to the suggested 30-45 minutes and my cooking process differs slightly from Cathy’s. This is a wonderful condiment with many pork and chicken dishes, and makes a delicious marinade for pork tenderloins. As Cathy suggests, any ripe plums will work here. 1. Pit and chop the plums. Set aside. 2. Using a large, heavy-bottomed pot, heat the vinegar and sugar until it comes to a boil and sugar has dissolved. 3. Add the plums and the rest of the ingredients. Heat until mixture comes to a boil. Lower heat and allow sauce to simmer for 2 hours, stirring occasionally. 4. 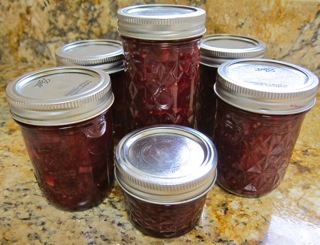 Ladle into sterile jars and process according to safe canning procedures. If you choose not to can the sauce, it will keep in the fridge for several weeks. I have yet to try freezing it. I really like Cathy’s recipe too! I have made several adjustments and have also added cherries to mine (great minds!) – especially as the seasons collide here in the markets. I like your tweeks! Great post my friend. Thanks, Wendy, it is such a flexible recipe. This looks wonderful! I’ve been on a plum kick and am adding this to my list to make and enjoy. I hope you try it – any combination of plums will work here. This looks great, Liz. It looks like you used red plums. I think I am going to make a batch this weekend. I actually used dark purple plums with a pale yellow flesh. As they cooked, this was the color that evolved. Perfect timing – I just purchased a bag of plums at the farmers market. Nearly the end of the season! I have been eyeing the farmers’ market plums…now I have a plan! I’ve made this wonderful sauce!!! Thanks for the reminder of it – I’m planning to make this one again this week! !